The following is the transcript of the narrative from that video. (Note: I’ve added additional items I forgot to mention in the video in italics, and have inserted NOTES with extended information on certain items, and provided a list of references at the end). INSERT: Visible but not mentioned is endorsement on this paper by a representative of the American Enterprise Institute, Rick Hess, who ironically vocalizes public skepticism of the Common Core. See the actual document for a full list of signatories. Is it possible to post the graphic in the video? Thank you. I’m happy to try and send you some pictures of the chart! but they’ve been taken in segments-i am so low tech its really sad! This is a great chart. Try using the “Panorama” picture feature of a digital camera to get it all, or take at least three across the top and three along the bottom. I would “stitch” them together into a larger, single file. Also, a presentation program called Prezi could really bring this to life since it lets you create a huge graphic where you ZOOM in to see details, pictures, embedded videos. If I can get the readable digital pictures, I will try creating a Prezi for you where you could record audio for each section. Look at examples at Prezi.com . I was planning to do one on both Common Core and Agenda 21 anyway. 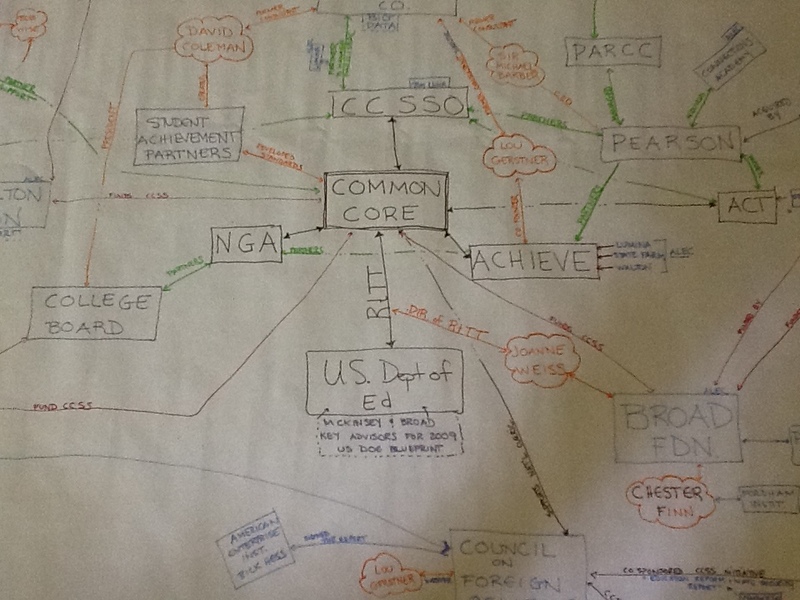 Email the pics to me at fiscalrangers@comcast.net – I have a large Factsheet on Common Core at http://www.tinyurl.com/HaltCommonCoreNow . Please scan and send as a jpeg. I would be happy to make a real graph out of what you send and give you and your website the credit for the work. This would make a great poster to have for presentations on Common Core. I think we could work together and make this into something really useful to us out here trying to connect the dots for everyone. You are awesome! !